Discover the fascinating work of ceramic artists in Korea today. Bringing together the work of fifteen emerging and established artists from Korea, this display offers a glimpse into contemporary Korean studio ceramic practice. Some are inspired by historical Korean ceramics such as inlaid celadons from the Goryeo dynasty (918-1392) or white porcelains of the Joseon dynasty (1392-1910). 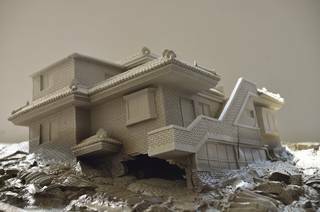 Others experiment with new technologies and alternative materials, or use ceramics as a medium to engage with contemporary issues ranging from mass-consumption and pop culture to the destruction of Korea's architectural heritage. Starting on Monday 18 September, one of the pieces on display – an unfired clay house by Kim Juree – will be slowly dissolved in water into a puddle of mud. Kim uses ceramics as a way of commenting on the constant cycle of urban development in modern Seoul and the disappearance of its architectural legacy. Exhibition originated by the Fondation d'entreprise Bernardaud and their guest curator Hyeyoung Cho, organised and curated for the V&A by Dr Rosalie Kim, Samsung Curator of Korean Art and supported by the Korea Foundation. Additional support provided by Samsung.